How do cells decide what role they are going to perform in the body if they can only communicate with neighboring cells? 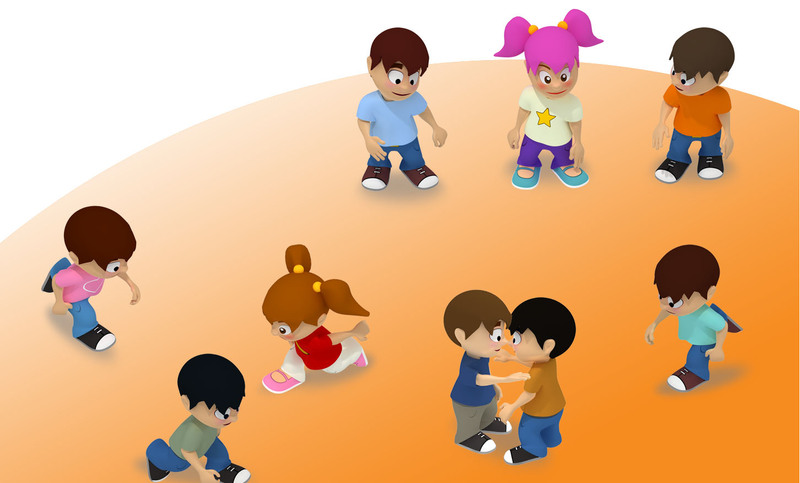 In this game players experience how their functions can change according to the messages they receive from their neighbors, and the impact that this process will have on the whole group. Let's play this swarming game! Time required: explanation 3 minutes, play 5-10 minutes, conclusions 2 minutes. Special conditions: Number of players 20 minimum, better 40 or more in a room or outdoor space allowing free movement. Divide the group into three subgroups. Give each group a name: water, sponges and fire. The play is about moving freely in space, find other players and exchange information with them. To exchange information, the two players facing each other have to stop, look at each other and hold the right hand on the shoulder of the other. The water extinguishes fire: fire becomes water. The fire burns the sponge: sponge becomes fire. The sponge absorbs water: water becomes sponge. If both children are already the same, there is no change. Every one or two minutes the monitor whistles to stop the game (the players stop and sit on the floor) and counts how many children there are in each group. It may take notes of the results in a table and then will analyze how each state evolves. The game ends when one state is extinguished, but may stop at any time.